"Atomic Annie" redirects here. For the French businesswoman and nuclear power advocate, see Anne Lauvergeon. The M65 atomic cannon, often called "Atomic Annie", was an artillery piece built by the United States and capable of firing a nuclear device. It was developed in the early 1950s, at the beginning of the Cold War, and fielded, by 1953, in Europe and South Korea. Picatinny Arsenal was tasked to create a nuclear capable artillery piece in 1949. Robert Schwartz, the engineer who created the preliminary designs, essentially scaled up the 240 mm shell (then the maximum in the arsenal) and used the German K5 railroad gun as a point of departure for the carriage. (The name "Atomic Annie" likely derives from the nickname "Anzio Annie" given to a pair of German K5 guns which were employed against the American landings in Italy.) The design was approved by the Pentagon, largely through the intervention of Samuel Feltman, chief of the ballistics section of the ordnance department's research and development division. A three-year developmental effort followed. The project proceeded quickly enough to produce a demonstration model to participate in Dwight D. Eisenhower's inaugural parade in January 1953. After the successful test, at least 20 cannons were manufactured at Watervliet and Watertown Arsenals, at a cost of $800,000 each. They were deployed overseas to Europe and Korea, frequently shifted around to avoid being detected and targeted by opposing forces. 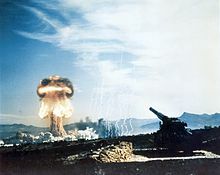 Due to the size of the apparatus, their limited range, the development of nuclear shells compatible with existing artillery pieces (the W48 for the 155 mm and the W33 for the 203 mm), and the development of rocket- and missile-based nuclear artillery (such as the Little John and Honest John tactical nuclear missiles), the M65 was effectively obsolete soon after it was deployed. However, it remained a prestige weapon and was not retired until 1963. Of the twenty M65s produced, at least seven survive on display. Most no longer have their "prime movers". The Virginia War Museum in Newport News, Virginia has been erroneously identified as possessing a 240mm prototype of the M65. The weapon at the Museum is actually a conventional 240mm T1 Gun, one of two produced as part of a separate design program which was abandoned in favor of the T131 280mm Atomic Cannon program. Both the T1 and T131/M65 share T72 carriages. List of U.S. Army weapons by supply catalog designation (SNL D-57)? ^ a b c d e "280mm Atomic Annie Artillery". OliveDrab.com. Retrieved 2008-10-11. ^ a b c "M65 Atomic Cannon". GlobalSecurity.org. Retrieved 2008-10-11. ^ "History of the Atomic Cannon". Atomic Cannon. Retrieved 4 March 2019. ^ "Atomic Cannon Page". Sam Berliner's Ordnance Pages. Retrieved 4 March 2019. ^ "Historic Fort Sill Cannon to Receive Restoration". ^ "Atomic Annie on the Move". ^ "Virginia War Museum". Informational Didactic for T1 Gun. February 19, 2019. Wikimedia Commons has media related to M65 Atomic Annie.